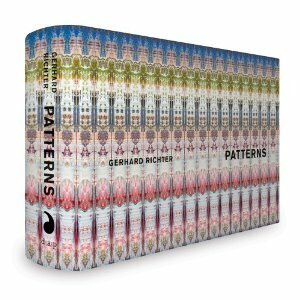 Patterns represents a brilliant new adventure in image-making and book-making by Gerhard Richter, who in recent years has produced several fascinating explorations of the possibilities of the artist's book. For this latest project, Richter took an image of his work "Abstract Painting" (CR: 7244) and divided it vertically into strips: first 2, then 4, 8, 16, 32, 64, 128, 256, 512, 1,024, 2,048, up to 4,096 strips. This process, involving twelve stages of division, results in 8,190 strips, each of which is reproduced here at the height of the original image. With each stage of division, the strips become progressively thinner (a strip of the 12th division is just 0.08 millimeters; further divisions would only become visible by enlargement). Each strip is then mirrored and repeated, producing an incredibly detailed patterning. The number of repetitions increases with each stage of division in order to make patterns of consistent size. The resulting 221 patterns are reproduced here on landscape spreads, making for a truly extraordinary reading-viewing book experience.